PPC advertisements offer a limited number of characters in which to sell a website to users. In 25 (title) and 70 (body text) characters, online marketing teams must inform, engage and inspire. To this end, PPC campaigns must be to the point. You usually have only 12 words or fewer to persuade users to visit your site. Be succinct and be direct. A PPC campaign should ideally include two mentions of the intended keyword. It is considered best practice to include a keyword in both the headline and in the body. Capitalisation is also an accepted standard in PPC campaigns. Capitalise the first letter of every word to ensure the body and headline text catches the user's eye. In order to stand out against rival PPC campaigns, an advertisement needs individuality. One of the easiest ways to assure this is to create a unique selling point. Many online marketing campaigns focus on current deals or promotions being offered by a website. The following is a search for the highly competitive term 'online shopping'. Over half of these campaigns are highlighting current promotions or sales. And for good reason. 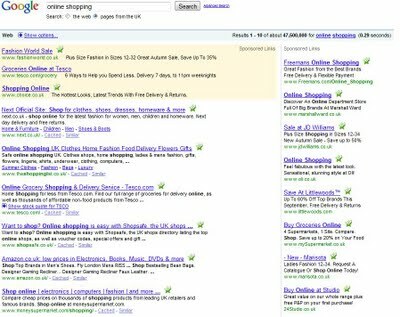 PPC advertisements should highlight current promotions in an attempt to convince users to click. These calls to action are vital if users are to click a particular PPC advert. It is essential that the phrase inspires urgency and immediacy, as it encourages users to immediately choose that advert amongst all others. Write two or three different PPC advertisements. During a campaign, search engines such as Google will begin to display the most effective advert more frequently than other varieties. Take lessons from each campaign and use proven words and phrases in different online marketing strategies.